Renault's Alpine performance brand may have been all but forgotten by the public, but work is already well underway to create a production version of a chic new Alpine sports car. Unveiled at the Le Mans 24hr race last weekend, a blue and orange concept version of the two-seater sports car, also known as AS1, took to the iconic track 90 minutes before the start of the race. 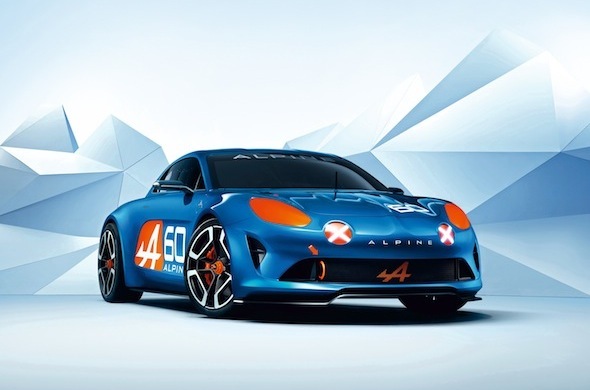 Set to arrive in 2016 as part of an Alpine brand revival, this new model, which has been created to celebrate the marque's 60th anniversary, shares the rear-wheel drive, rear-engined layout of previous Alpines, with its design also harking back to models form the 1960s and 1970s. With a hunkered down silhouette, smooth, flowing lines and the engine slung out the back, this new Alpine shares many cues with the historic Alpine A110. Details surrounding the engine size, power and weight are yet to be revealed, though it is likely that the new model will produce around 300bhp and feature a lightweight chassis, helping it to take on Lotus at its own game. With Renault executive vice president Bruno Ancelin telling Auto Express that the hopes for the resurrected brand to take on Audi and Porsche in the upmarket compact sports car market, it is likely that the AS1 will be available from around £50,000 upwards when it arrives next year. Thanks to its pared back, lightweight format, the new model embodies the Alpine spirit, which founder Jean Redele described as: "epitomising the pleasure of driving on mountain roads." He continued: "The most fun I ever had behind the wheel was driving through the Alps in my five-speed 4CV, and it was essential for me that my customers should experience this same level of enjoyment in the car I wanted to build."